An ID card has been found outside Moulton Surgery. If you have lost one, please contact: 491200. Only a few days to go until our 2nd Food & Drink Festival. So many tasty stalls selling food & drink, you really don't want to miss this one! Northamptonshire Police are appealing for information regarding a Burglary Dwelling, which took place on Sandy Hill Lane, Moulton. Between times stated, unknown person(s) have smashed a rear patio door to one of the new buildings. Once inside power tools stolen belonging to contractors for the site. Anglian Water are requiring to install a new road crossing for the development on The Avenue. To undertake this work safely will require that the road is closed to through traffic from the 26th November until the 30th November 2018. We're looking for footballers who fancy a regular game of 7ish a side. We play at Moulton College, 6pm-7pm on a Wednesday. All ages and abilities are welcome - we range from 16-58 years old and with the full range of skills and ability on display. We're not a league or formal team, just a bunch of lads who enjoy a run out each week. Northamptonshire Police are appealing for information regarding a Theft from Motor Vehicle, which took place on Northampton Lane South, Moulton. Between times stated, unknown person have gained access to vehicle using unknown means. No damage to vehicle, items taken from within. Following the success of our last Food & Drink Festival back in March we are really excited to be hosting this event again, so come and buy some treats from our tasty stalls and have a bite to eat whilst your here. 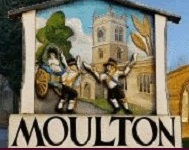 Moulton Parish Council will not tolerate abusive or oppressive behaviour either within or from outside the council. We will support individuals affected by such behaviour with a robust response and, if necessary, with procedural or legal redress. XHTML 1.0 validated. WCAG compliant. Page generated in 0.2882 seconds.